first off hi Rossco here. i dont have a vvti model but assume the fuel maps would be the same? i changed the closed loop lambda to auto wide-band and turned off the vvti function. selected the 4 bar MAP and saved the file to a usb stick. am i able to load that file and safely start the car? i will get it tuned just need it to run been to long to not here it since its here in my garage. any help would be great and before you ask no its not boosted as of yet just a standard engine with this ECU and wiring setup running a r154 manual gearbox. ok i unlocked my ecu that was all good. after reading i went to do the firmware update also. ecu was connected and everything looked good. a message popped up to cycle power and i did then it said an error accrued. and now the ecu is in boot mode and i can not connect to the ecu, how can i fix the firmware if i can not connect to the ecu. The ECU will usually only get stuck in boot mode if there is a wiring problem that is preventing the ECU from fully shutting down during the "power cycle" step. So to make sure it is getting completely powered down either unplug the main ecu connector or disconnect battery. Re-connect then do the firmware update again, this time when it gets to the power cycle step, disconnect ecu/battery again for a few seconds before reconnecting then click ok to continue. Unplug the ecu, leave it off for a few minutes. Then power up again and try to run the Firmware update again (pc link doesn’t need to connect). You can just install the same firmware again. yes it gave me a reinstall option and seems to have worked. i should be ok to load this base now yeah? 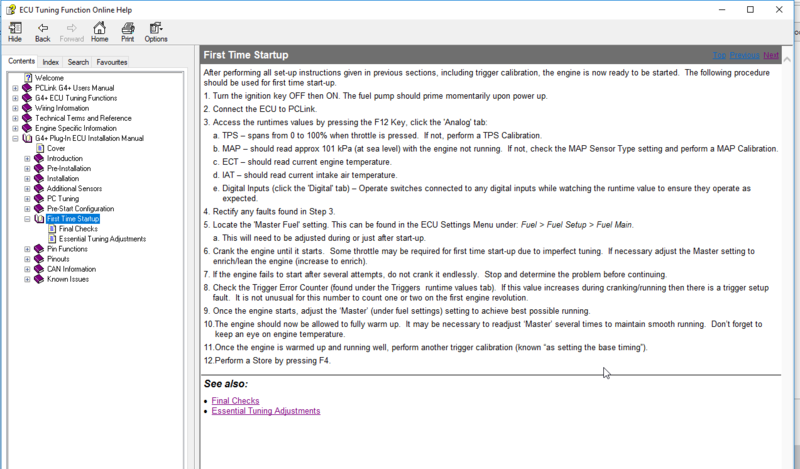 Note the non-vvt engine has a different trigger pattern so just in case you didnt know that there is some basic set up info in the help file. You can ignore the "twin distributor" setting. You can do that by setting injection mode to "off". awesome info thank you. ill update that to the base map and do another store to the ecu. just to confirm i am right in selecting the 4 bar map sensor before it has been configured? ive manually set the triggers to what you have shown me but the calibrate will not let me change the trigger offset to 4. its locked in at 234. is this something i must change also? Im not sure what you are asking here, but yes, all sensors must be correctly calibrated before starting. Click on that "set base timing" spanner, you can only enter the offset in that screen. Make sure you hit enter after typing it in so the box turns blue. in regards to the map sensor was just confirming that it will start with out a AFM since it no longer has one so long as i have it configured witch i just did then. ok the 234 has been changed to 4. i tried that before but i must have clicked done without hitting enter so thanks. anything else i need to change before trying to start? yes i have read that hence why i was going through all the map and tps calibrations. i was more thinking of anything else he may have thought like when he found the different trigger types as he mentioned above. other than that i was ready to try and turn it over for the first time but seems the battery is a bit flat after today so it didn't even want to give me the satisfaction of turning over let alone starting. ive found where they live in the ecu. if i change the error low from 0.05 volts to 0 will this clear the codes? You have AN Volt 4,5 & 6 set up as generic 0-5V channels and they are presently all measuring below what you have set up as the error low voltage. If they are not connected to anything then turn them off. If they are connected to something then set their error conditions up to something more suitable. doesnt seem like there used just has voltage next to them? If you havent connected them to anything then turn them off. So I went through all the paperwork that the auto elec wired everything to and made sure all the auxiliary and ai ao and di where in the right spot. I was missing a few things. I set them all up. One was the ecu power. Now when I turn the key off the ecu relay ticks constantly. How do I fix that. I tried messing with the ecu power on time but did nothing. Any ideas. You will need to make sure that the relay (ecu controlled) only has power to the other side of the coil when the key is on. If you have a look at ECU back feeding in the help file it covers what is happening. Ok sweet I'll give that a try thanks. So have a update. After a few months of dramas I've installed a new starter motor and the ecu power on relay is fixed. So after playing around with the file posted above. Went for a start and it no joy. Close but no joy. It may be the trigger for the crank sensor. As I didn't see any action for the voltage in file. Is there any chance to get some help setting the trigger up. File is basically the same as the one I posted above. 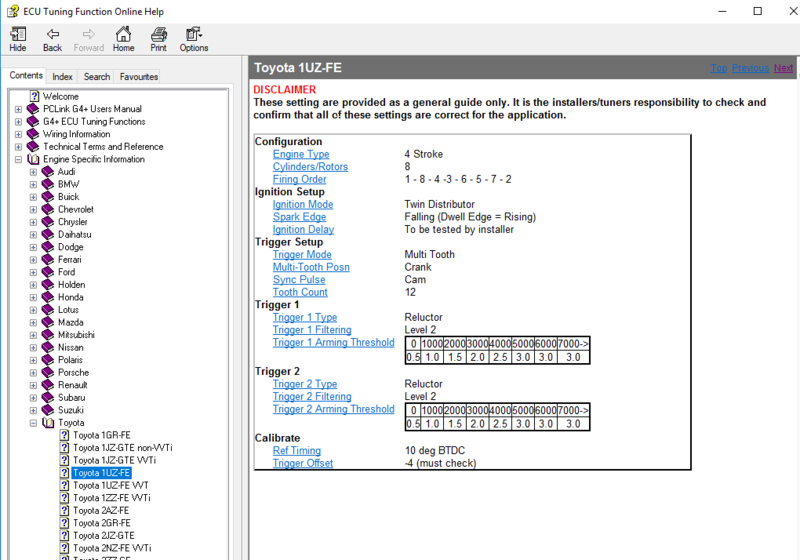 You trigger setup in the earlier file looks reasonable, what makes you thank you have a trigger problem? Are you getting RPM displayed when cranking? Are you getting spark etc? Have you checked base timing? Well has a rpm reading on the laptop when we go to crank. Haven't undone the coil packs yet as I feel it is getting spark as it feels like it wants to fire if that makes sense. Only reason I feel it's the trigger as the voltage didn't change or go green like all the other di do ai ao etc. I don't have my laptop on me atm other wise I would screen shot it.